“Building the Orderscape platform is the hardest most challenging and gratifying project I have ever done”. This is a quote from my very accomplished co-founder and CTO, Ted Cohn. I’m not surprised, really, considering he said developing a universal, full-menu ordering solution would be very, very hard about 19 months ago. But, he did it. And, we are grateful for his diligence, wizardry and persistence. After six attempts at certifying our first restaurant brand, the Fazoli’s 200+ unit Italian chain, Amazon passed us and certified the Fazoli’s food ordering skill worthy of being enabled on all Echo devices. This is huge milestone for our startup and we are all very excited and proud of this accomplishment. Our team is visionary, talented and motivated to bring our technology and domain expertise to more and more restaurants in the coming weeks and months. So, what does this mean? Well, this is great news for Fazoli’s, because now they have a new, very cool, leading-edge sales channel to accept food orders and engage interactively with their customers and, attract new ones too. This positions them as one of the only restaurant brands to offer Alexa food ordering. That alone is a big deal. In addition to Fazoli’s winning here, the consumer wins too, because they can leverage the most natural user interface (UI) their voice. Talk • Order • Eat. Simple and we believe, the wave of the future. Voice is everything and will be how people order almost anything from getting directions to a restaurant and making reservations to ordering groceries and of course, food. We are at the predawn of a new age; a consumer voice revolution and Orderscape is excited to be well positioned among the leaders for restaurant AI, conversational commerce and related FOH and BOH applications that will change how restaurants operate. 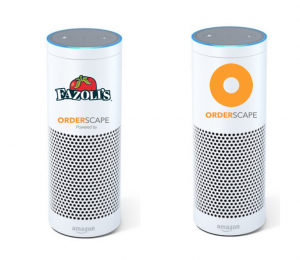 Also, a big shout-out to Amazon and their Alexa team for their diligence in helping make the Orderscape platform, with the Fazoli’s food ordering skill live. So, check it out here and use your Echo device to order a meal from a Fazoli’s near you. We’ll be adding more and more restaurants and promise to make it easier and easier to order via Orderscape across many gateways in the coming weeks and months. We believe 2018 is be a very busy and exciting year for the voice economy, restaurants and for Orderscape.